The appendix register was used extensively in the early days of the Society. It was a way of introducing genes into the breed gene pool, while keeping the provenance of the breed and compliance with the breed standard. The appendix register was used occasionally and under strict guidelines to ensure that provenance and genealogy was maintained. 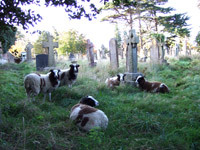 After nearly 50 years of the Jacob Sheep Society, the Appendix register was closed in November 2016 to new foundation entries. The inspection of unregistered ewes is now discontinued. Those Appendix B foundation ewes already in the system can still be used to produce Appendix A registered ewe lambs.